Bright Spring is Spring with a touch of Winter. Winter's effect is to increase the saturation of Spring's already-bright colors to a point of shocking brightness. Winter also cools the colors somewhat; warm fuchsias are introduced and True Spring's golden browns are dropped. The colors are also darker than True Spring's; they correspond to the darkest tones in the Bright Spring's hair, eyes or skin, which can read as black. 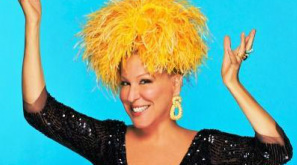 Bright Spring Bette Midler. A silly pic, but she is SO working these highly contrasting colors. Bright Springs are so saturated that they can carry black, but they need to combine it with bright, warm colors for it to look right. You've probably had great difficulty finding your season because no one looks at you and thinks "Spring." Your hair is likely dark, and your eyes and skin may be as well. You can wear black - - though alone, it doesn't bring out your true loveliness - - so you've likely been mistaken for a Winter. Weirdly, you're also often confused with True Summer; perhaps it's because your best colors include aquas and hot pinks, and grey can be lovely on you. Click here to see examples of celebrities who share your beautiful palette. 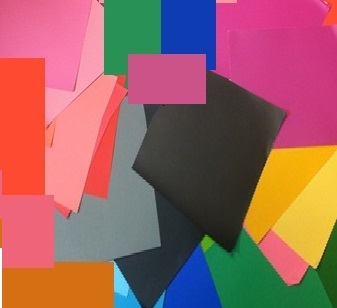 This list includes over 600 products that have been precisely matched to color-accurate Bright Spring swatchbooks. If you're a Bright Spring, you can use this list to buy your best makeup with confidence.